Chinese New Year is celebrated for 15 days, beginning on the first day of the lunar new year, which this year fell on January 23. I've never really celebrated Chinese New Year, but when I was searching for January crafts, Chinese New Year came up, and I thought it would be fun to learn about another culture, plus I welcomed the chance to get away from snowy projects and do something different. The ancient Chinese named each year for an animal, twelve in all, and supposedly people develop the character traits of the animal whose year in which they were born. This year is the year of the dragon. So on Tuesday, we made Chinese Dragon Lanterns, using this template from First-School (click for instructions). Or, I should say, Pal made a lantern. Roger colored his dragon, but didn't want to cut it so he just has a dragon. On Thursday we read Dragon Dance: A Chinese New Year Lift-the-Flap Book by Joan Holub, illustrated by Benrei Huang. It's a cute book, with colorful illustrations and a nice brief explanation and overview of Chinese New Year, just perfect for preschool attention spans. The fact that it's lift-the-flap is an added bonus. Another bonus is the instructions for a craft printed on the inside back cover of the book--a dragon puppet! So, of course we had to make one. It was cute and very easy to make, using a paper bag, some construction paper, markers, and glue. In celebration of Chinese New Year, Panda Express sent me a bunch of coupons good for a free kids meal--many more that we will be able to use. If you'd like one (or some), just send me a message via my contact form. I've linked this project up to a story + art = a great stART﻿ over at A Mommy's Adventures. It's been quite a while since the snowman-making conditions have been this good around here (a couple of years, at least), so this afternoon, the kids and I made a snowfriend. I was going for a more traditional look, but Roger insisted on adding a second, misshapen head, which made our friend look like a snowbug or a snowmartian, so we decided to just go with it. 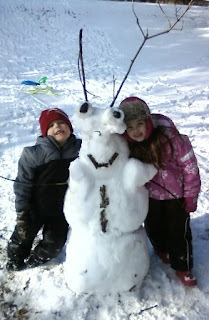 The kids were so proud of our creation! Some time ago, I reported about a trip I took to the craft store looking for gifts for my nephews. Didn't buy a darn thing, but I did leave the store with the most inspired idea I've had in a long time. See, my sis had mentioned her boys might like craft kits for Christmas (Chip claims she's craftitudinally challenged and therefore needs kits in order to do crafts), so I was looking for craft kits, but everything I saw, I thought, well I could put that together for less than that. Or, if I was going to make that thing, I would use this other material. I just couldn't bring myself to buy any of them. And that's when Camp Scarlet's Craft of the Month club was conceived. Each month, the boys receive supplies and instructions for one or more seasonal crafts. So much fun! Don't you think that's a great idea? 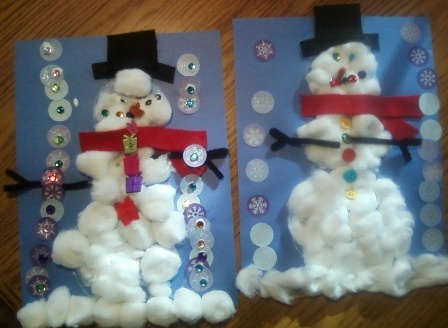 The boys like to do crafts, their mom thinks she can't come up with crafts for them to do. Plus? It's the gift that keeps giving--every month, in fact (not sure if I can keep this up for a whole year, but we'll see). I've been reading the Percy Jackson & the Olympians series by Rick Riordan (thanks, Grandma & Grandpa Sheppy), and I finally understand how AKD can zip through them so fast. They are action-packed and compelling: very difficult to put down. I started reading a week and a half ago, and I've finished the 5 books of that series and I'm almost done with the first book in the next series (which, by the way, AKD read in 24, that's right: twenty-four, hours. Thanks, Grandma & Grandpa Bluefield). I wanted to show you Roger's finished Advent calendar tree. A couple of the things we glued on didn't want to stay on, but it was fun. My favorite was the googly eyes glued to polka-dotted paper. When the Bluefields were visiting, Beaver-ly, Chip, and I went after-Christmas shopping one day, and Beaver-ly bought a beautiful wreath. She wanted a box for it, so she grabbed some cardboard from the floral section of a grocery store we visited, to make one. The box idea got nixed by the vehicle packers, so we got to keep some lovely long sheets of cardboard--here's what we did with it. MC and Sawblock went to Polar Camp early in January. What a difference a year makes, eh? No snow! Still, it was terrific fun. We tried this fun no-mess marble painting technique from Valerie at Frugal Family Fun Blog. The kids l-o-v-e-d it, and I found it mesmerizing, as well, so much so that I had to make my own because the kids didn't want to share. Just be sure to use colors that will look good mixed together, because they do eventually mix. Roger used red and green and it turned the color of mud (about which, by the way, he was thrilled). Well, the weather forecasters tell me that snow is on the way--at this point I wonder if they're just trying to make me (temporarily) feel better, or if they really do think it's going to snow. I sure hope it does. I mean, what's the point of it being cold if there isn't going to be any snow to play in? In the meantime, the Camp Scarlet kids and I have taken matters into our own hands with snow themed projects the past couple of weeks. 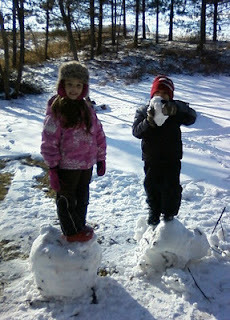 This one is from my good pal Valerie over at Frugal Family Fun Blog. Just use double-sided tape to make a snowflake shape and stick small pieces of aluminum foil to it. I found it was easiest to cut strips of aluminum foil and then let the kids tear squares from that (rather than just giving them a sheet of aluminum foil). This one is also from Valerie. It didn't turn out quite how I had imagined it, but it was fun. See, the problem was, the salt covered up the eyes, nose, mouth, and buttons...oh well. This one you've seen. 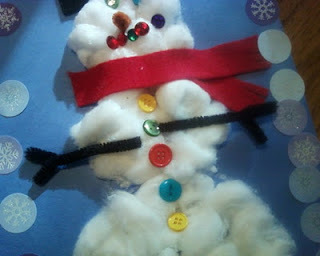 I traced a few round objects in a snowman shape to give the kids a guide for placing their cotton ball snow. We found that it works better to pull the cotton balls out a bit--makes the finished man a little flatter, which makes it easier to glue other stuff on. The kids added "gem" eyes and mouth, button buttons, pipe cleaner nose, and a felt scarf and hat. I got this recipe from Family Circle's December issue, but it doesn't really matter. 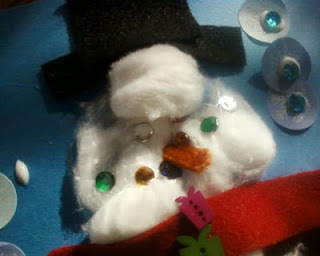 Just take any round cookie and decorate like a snowman face--so great for developing those fine motor skills. I was planning to make these when the other half of our nephews were visiting, but based on some half-muttered overheard comments, I decided to skip it (by the way...I can hear you). Their loss--the cookies were delicious and cute. And on a side note, this was my first time ever working with royal icing. Totally easy and non-intimidating :) I can see now why bakers like it for certain projects, including gingerbread houses. We heard it was going to be bitterly cold today (-11*F when I woke up; -8*F right now), so on Tuesday, the kids and I made some colored water and put it on our back deck to freeze. 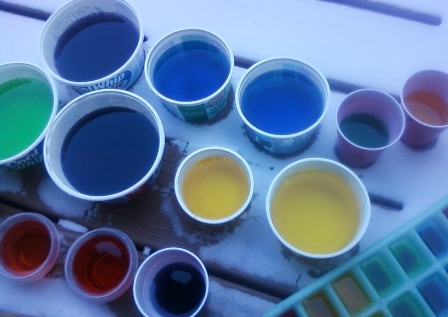 In the process, we learned a little something about color mixing--Pal was pretty amazed that if she mixed yellow and blue together she got green. We left our containers of colored water outside until this morning, when we dumped them out onto cookie sheets and got to work building. I was a little concerned that this activity wouldn't hold their interest for too long. I mean, once you build a tower, what else is there to do? But the kids had so much fun--they were playing with the ice for over 45 minutes, and I'm sure they would have continued, but our third friend arrived and they raced off to do other fun things. Most of the time when I invite the kids to do art projects with me, I have an idea in mind of what the final product should look like. I kind of have to, right? So I'll know which supplies to get out. And each time we do a project, I experience an inner struggle. I want to "correct" them. I want the kids to do the project the way I see it in my head. 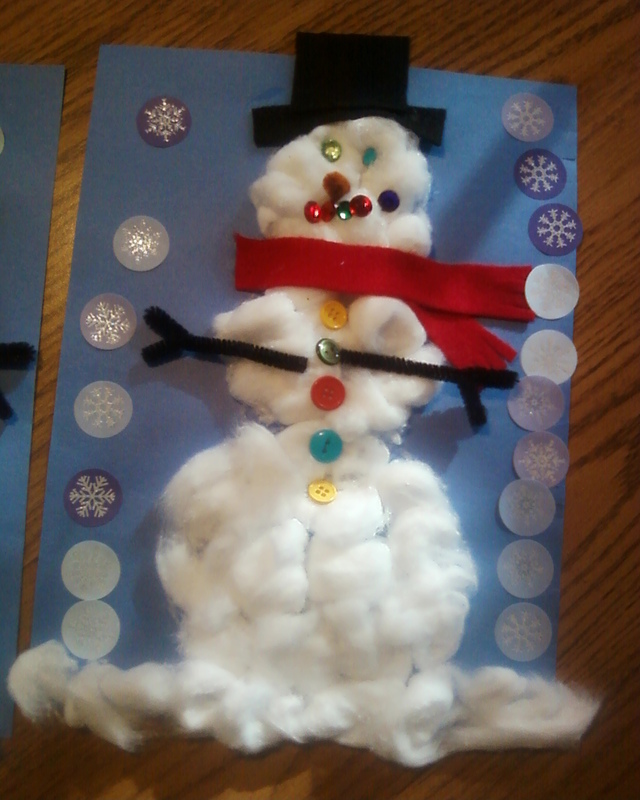 For instance--just look at this snowman's arms. Don't you think they would look much better if they were angled down? And tucked underneath instead of laying on top? Snowmen arms in nature never look like this. 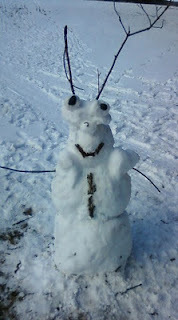 And what in the world happened to this snowman's face? Is that a puss-filled something or other on his forehead? And that must be a wart on his nose. And presents for buttons? What was she thinking? It takes an almost physical effort to let go, to let them make their own decisions in the creative process: to realize that this is not my project, it's theirs. To remember that it's not about the finished product, it's about the process. In truth: sometimes their projects just turn into a big gluey (or paint-y) mess. And I have had to learn to be OK with that. If I really want a snowman, or flower, or turkey, that looks like the one in my head, I need to make my own (too bad we're out of cotton balls because Pal didn't want to implement my suggestion to pull the cotton balls out to make them flatter (and have more surface area) before gluing them to the page). Parenting is like that, you know? We have this idea in our heads of how things should go--what our children should be like, what they should do and be. We want them to make the choices that will lead to them fulfilling that vision. But really? We have to let go. We have to let them make their own choices; find their own vision of what they should be. And in the process, even if they don't turn out exactly how we imagined, we discover that their vision is beautiful. So I gotta apologize up front for the poor picture quality in this post. As I mentioned yesterday, my husband has run off somewhere with the camera again. My cell phone does not have a flash. It was night time. 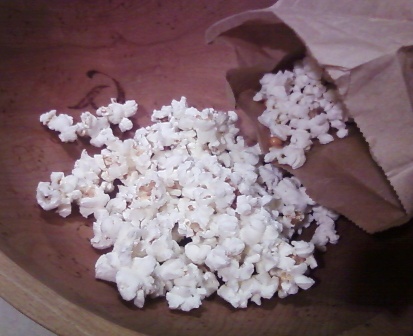 Anyway, we ran out of microwave popcorn. I know--hard to believe such a thing is possible, considering that 67% of my children sell the stuff every fall. But, somehow it happened. The children were appalled--aghast, even, that I would allow this to happen. At the same time, we had some popping corn that someone had given us a couple of years ago, but that we had never popped because we don't have an air popper, and popping it on the stove seems like too much work (all that shaking). 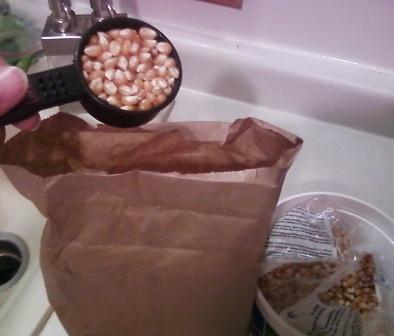 So this microwave popcorn shortage gave me the perfect excuse to try out a fun little trick to make popcorn in the microwave. All you do is put about 1/4 cup of popping corn in the bottom of a regular paper lunch bag. Fold the top down twice and put it in the microwave. 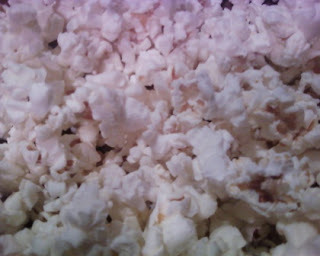 Set the microwave to cook at high power for 4 minutes, but just like with regular microwave popcorn, to prevent scorching, stand by, and stop the microwave when the popping slows to 1-2 seconds between pops. Next, season as desired, and enjoy! So far, we've only tried melted butter and salt, but you could try commercially available popcorn seasonings, or I've heard dry ranch dressing mix, taco seasoning mix, or cinnamon/sugar is good. You can even save the bag to use again next time! Popcorn is a delicious, whole grain treat and making it this way is not only less expensive than buying commercially available microwave popcorn, it's also better for you, and you're not consuming a bunch of unpronounceable ingredients. The first time Hubby saw me do this, he was amazed. 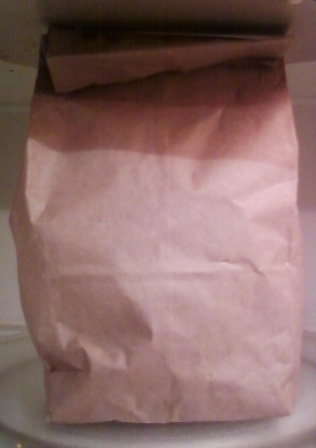 He just couldn't get over the fact that all I had to do was put some popcorn in a bag and the bag in the microwave. Try it--it works! So, last week, Pssst...General Mills sent me a full-sized box of their new Frosted Toast Crunch cereal to try. Wasn't that nice of them? I thought so, too. I'm not really a fan of frosted cereals, or actually any cereal, so I decided to get some input from my resident taste-testers. These kids are highly qualified to offer an opinion on breakfast cereal, since they would eat it for breakfast, lunch, and dinner every day if I let them. The verdict: thumbs up! Three out of three tasters loved it. With such glowing reviews, I knew I had to try it, too. The square itself tastes similar to the regular Cinnamon Toast Crunch square, which is neutral flavored, like crunchy puffed white rice. The frosting, described by General Mills as "the delightful taste of vanilla frosting flavor* and dusted with a delicious dash of cinnamon," tastes kind of like the topping on powdered sugar/cinnamon mini-donuts. Yes, it tastes vanilla-y and cinnamon-y. Pretty good, if you're a fan of breakfast cereal. By the way, our box was gone within 2 days, and it only lasted that long because I told the kids to save some for their father. I'm actually not sure if he got any. They really, really like it. And with 11 grams of whole grain, just 9 grams of sugar, and a good source of calcium, Frosted Toast Crunch is better for you than it sounds! So are you ready to "take your cereal to the next level with this wholesome breakfast?" 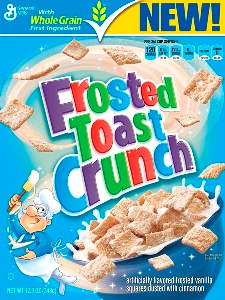 Frosted Toast Crunch is now available--look for it at your local grocery store. Why is the thing for which we are searching always found in the last place we look? Well, because after we find it, we stop looking, of course! So, the boys in my life have developed a new and annoying habit. OK, not so new for some of them. And I suppose it's possible that it's not so new for all of them but I just haven't noticed before. They ask me where things are. All 4 of them have decided that I know where everything in the world is. It's true that I know a lot of things, including where most of the items in our home are supposed to be, however, in real life, it is somewhat rare that everything in our home is actually located where it's supposed to be. What am I saying? I don't think it has ever happened that absolutely everything in our home is where it's supposed to be. Maybe long, long ago, in a land far, far away, before we had children. It's entropy's fault, really. And while some days I am able to muster up the energy to battle it, I know it's a losing proposition. Entropy has infinitely more resources than I do. So, when I'm looking for something, know what I do first? I look where it's supposed to be. It's a good first step, right? A resonable first step? I mean, it's possible that it actually landed in its correct location. Know what my boys do when they're looking for something? They ask me where it is. And here's the problem. When someone asks me where something is, I assume that they've already taken that reasonable first step, that is, they've looked where it supposed to be. And, if they've taken that step, and still need to ask me that question, the item was not where it belongs. So if I want to answer the question, I need to start thinking of other places it could be. And so, being the nice mama/wife that I am, I start looking for whatever it is, not looking where it's supposed to be, because any reasonable person would have already eliminated that possibility before enlisting aid. So I was walking along this morning, praying, as I often do while I am walking. And I prayed, among many other things, that God would soften someone's heart. A pan, with food stubbornly stuck to it, soaking in soapy water: filled, and surrounded with suds. Do you ever do that? Do you soak the pots and pans that are impossibly dirty, to make them easier to clean? The water and soap softens those stuck on food particles, and in the morning, when the soaking is done, what was impossible, now is easy. I think we all have some of those stubborn places in our hearts that could do with a little God-soaking, don't you? Some empty places that could use a little God-filling, too. Believe me, I have prayed hundreds of times for all kinds of hearts, including my own, to be softened, and never before has God replied so immediately and boldly. In fact, not 60 seconds before, I had prayed for someone else's heart to be softened, with no immediate response. I think it means that God has heard my prayers and answered...be patient...I'm working on it...but he's not yet ready to be scrubbed--he's soaking. So I will continue to pray, knowing that right now, God is soaking that hard heart in His grace, drenching it in love, preparing that stubborn heart to be cleaned. Knowing that sometime soon, that breakthrough will come. This morning found me in the boys' room, putting their clean clothes away. Lest you think less of me, let me assure you that this is a rare occurrance--generally, the boys put their own clothes away. But, I happened to be down there, and was feeling generous, so I started putting clothes away. It was all going rather swimmingly, when suddenly, it occurred to me that today is Monday. A split second later, my brain pipes up, "well, at least you have clothes to launder," which reminds me of a friend of mine. She has this habit of always looking on the bright side. Always. That is exactly the kind of thing she would say if I complained to her about the never ending drudgery that is my laundry. I actually find this habit of hers a little annoying. I mean, all I want to do is wallow in my misery for one (ok, maybe five...or ten) measly moments, and here she is pointing out that I am blessed beyond measure. Thank you kindly, friend, but I already know that--it's kind of a given. That's the knee-jerk unspoken thought that accompanies each and every one of my gripes and complaints. I am so blessed to have these trivial things to complain about. But you know, there is power in the spoken word. You know there is. Even if no one is there to hear it, words, once spoken, can never be recalled. I've mentioned before that the voices in my head sometimes tell me terrible things. Well, because of them, I've kind of gotten used to the fact that not everything my brain tries to tell me is true. It's all in my head, and therefore, is suspect, including the good stuff, like "I am so blessed to have these trivial things to complain about." Might not be completely true. Nobody said it out loud. So I'm thinking I might be speaking these things out loud a little more often. Love you, friend--you teach me so much. Hopefully I won't annoy myself too, too much. By the way, if you just sorta skipped over that link up there, take another look. It's a worthwhile post to read--a great reminder to be gentle with ourselves. I know a woman who has never met a stranger. She is so friendly and open and can talk to an.y.body. I want to be more like her. I know a woman who can do anything, and do it beautifully. Cooking, sewing, decorating, gift-giving, mudding and taping drywall...she is good at everything. I want to be more like her. I know a woman who is incredibly generous with her time, talents, friendship, and resources. I want to be more like her. I know a woman who is gorgeous and so witty--she's the life of every party. I want to be more like her. I know a woman who is great at setting goals and following through with them. She can accomplish anything. I want to be more like her. I know a woman who just oozes Christ-like-ness. You know that song that goes, "they will know we are Christians by our love..."? That's her. I want to be more like her. Do you recognize yourself, sisters? Because these women are you. I want to be more like you. "Girls: There's always going to be that girl you think is much prettier, funnier, sweeter and just generally more perfect... but have you ever realized that you're probably that girl to someone else?" No, actually. I hadn't. Have you? I mean, I live with myself. All the time. And I am the very best person in the world at noticing my faults and imperfections and ugliness. How could anyone (in her right mind) want to be more like me? I don't even want to be like me sometimes. But even though I find it difficult to believe that I could be that girl to anyone else, I've realized that while there is something extraordinary about each of these women that I admire, something special that I wish I had, none of them is perfect, either. At least, I don't think so. So let's make a pact, sisters, to remember always that each of us is that girl. Each of us has an extraordinary quality (or two) that is worthy of admiration, even when we are unable to see it. And maybe, just maybe, there is someone out there who wishes she was more like you. So Valerie (my crafting hero)'s 7 year old daughter has a blog. Valerie's 7 year old daughter has a blog. What? I'm so impressed. Really. I'm sure there are other 7 year olds in the world who blog, but I haven't met any of them. Anyway, Emily said that she was inspired by another blog, Crappy Pictures, which, of course, I had to check out. It is so funny. It is rare that I can say something I read makes me laugh out loud, but Amber's Crappy blog...well, you'll just have to read it, too. Oh. I should mention that probably 87% of the reason I think Crappy Pictures is so funny is because I'm a mom entrenched in my kids' childhood. So if you're not a mom, or not in the same stage of life as me, you might not think it's quite as hilarious (but it still might coax out a chuckle or two). Here's to more laughter in the coming year!